Junior Alex Meyer's set design for the Augustana Theatre's production of "When the World Was Wild and Waste" earned a second-place award at the national Kennedy Center American College Theater Festival held last month in Washington, D.C.
Meyer's work advanced to the national festival after winning first place in the Kennedy Center's regional competition earlier this year. Learn more about Meyer and his work in this KELO-TV interview. The junior art and theatre double major from Sioux Falls called the opportunity to participate in the festival an honor. 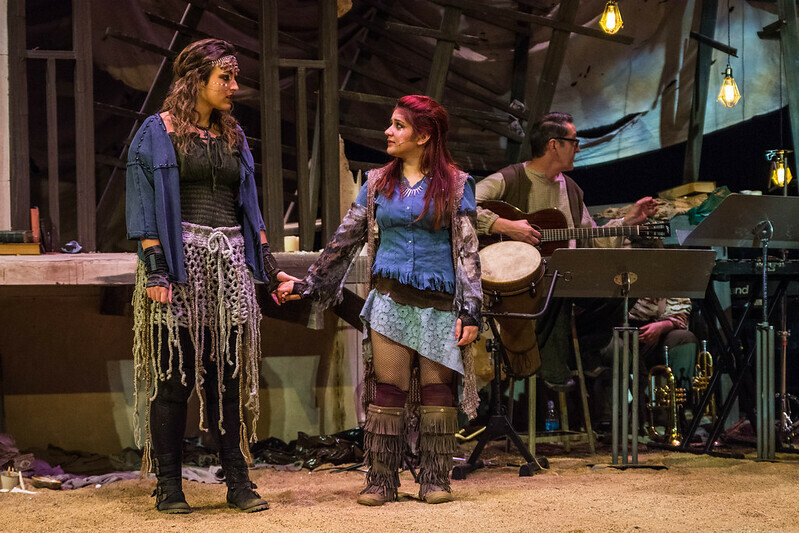 "Having the opportunity to take my work outside of campus to a national-level conference is proof that the work of the theatre reaches beyond the walls of the theater building," he said. "There is reassurance that I’m pursuing the right path not only because of my success in D.C., but largely because I didn’t feel out of place among the other design students. The Kennedy Center was host to an unbelievably supportive environment, and we were all rooting for each other all week long." As an artist, Meyer said he enjoys seeing his work come to life on a stage. "The visuals of the stage are the most intriguing thing to me about theatre," he said. "Being able to work creatively and express myself while collaborating with the overarching umbrella of the production is a unique challenge, but one that keeps me on track as a designer." "Having your work come to life on stage through actors and other designers’ work is exhilarating, and it’s the moment I work for in any show I’m a part of." Working on the scenic design for "When the World Was Wild and Waste," a show written by Dr. Richard Swanson, professor of religion, composed by Dr. John Pennington, professor of music, and directed by Jayna Fitzsimmons, assistant professor of theatre, offered Meyer new opportunities to think artistically. "The script was unlike anything I’ve worked with before, with nothing but pure language on the pages. It wasn't broken down by character or scene like a traditional script, and that seemed to open doors for me as a designer," Meyer said. "Fewer restrictions surrounded location of action, and more emphasis was placed on the mood of the world the stories were told. This process was very organic, with gestural qualities in initial sketching and sculptural qualities in model making. As a production team, however, we moved fairly quickly, with only five weeks from finished script to performance. The process of designing was pretty direct, and Jayna and Dr. Swanson and I were all on the same page from the start." Fitzsimmons called Meyer an "ideal collaborator." "When we were working on 'When the World Was Wild and Waste' in the fall, we knew Alex's design work was special — it had to be to match a script as challenging and imaginative as Richard's," Fitzsimmons said. "Richard's notes on the play's setting are lyrical, image-rich, and open-ended — in other words, a challenge to any designer! But, Alex is an excellent listener who pays exceptional attention to detail, and that made him an ideal collaborator as we worked together to bring this complex piece of theatre to the stage. I am so proud of the work we all did together, and we are so happy that Alex is being recognized at this level. As a department, we are so proud of Alex's accomplishment and the regional and national recognition his design work has received. Alex's design was one of just eight in the country being considered for this honor, and the fact that he came in second among a group of accomplished undergraduate and graduate level designers from all over the country speaks to Alex's strong work ethic and intense creativity." Looking ahead, Meyer said he hopes to pursue a career in scenic design after graduating from Augustana. "After graduation next year, I intend on working for at least a year before returning to grad school. That will be an experience that not only prepares me for the work I will expect in order to earn my MFA, but will answer my questions about the field in general, and reassure me that I’m doing what I want to do. Whether I do freelance work or teach at the collegiate level will come later. I just know that if there’s passion behind my work, a career as a theatre artist is certainly viable," he said.